Martin Scorsese’s return to the contemporary gangster genre — via a remake of Andrew Lau and Alan Mak’s glossy, stylized Hong Kong film of 2002, “Infernal Affairs" – has a bored, dutiful feeling, as if Woody Allen had been forced to remake one of his “early, funny ones." The plotting is completely artificial, and makes sense only within a context of self-conscious formal play: a junior member of Boston’s Irish mob (Matt Damon) is assigned by his eccentric godfather (Jack Nicholson) to infiltrate the ranks of the Massachusetts State Police, at the same time a dutiful police cadet (Leonardo DiCaprio) is assigned by his boss (Martin Sheen) to ingratiate himself with Nicholson’s gang. For the first hour or so, Scorsese and his editor, Thema Schoonmaker, treat the material as a premise for a virtuoso exercise in parallel montage; the film achieves a fugue-like structure at times, as Scorsese and Schoonmaker move through three or four levels of simultaneous action at once, finding creative and sometimes quite beautiful transitions based on matching rhythms, textures, movements, and shapes. The movie works smashingly, especially if you haven’t seen its Hong Kong counterpart and haven’t a clue what’s coming. But for all its snap, crackle, and pop, it’s nowhere near as galvanic emotionally. The star of "Infernal Affairs," Tony Leung, had the stillness of a volcano; in the film "Hero," he made practicing calligraphy seem fiery. DiCaprio, as good as he is, is on the lumpish side. He has a wide face and lots of brow to furrow, but Scorsese doesn’t linger on him long enough to help us connect with his feverish alienation. It’s easier to read Damon, with his darting little eyes and slippery-squirt smile, but we don’t give a fig about him. [Screenwriter William] Monahan has made the character more of an out-and-out villain—a conscienceless opportunist—than he was in the original. Sullivan hungers for a career in politics. He has no loyalty to anyone, not even his surrogate-father crime boss, and so he has no dramatic stature. Plus, he’s lousy in bed. Predictably, the dirty cop is having no trouble pretending to be clean, but this very ease is problematic. Sullivan remains a cipher, leaving Damon with precious little character to develop. He relies on his screen charm, which can be considerable, and his "Good Will Hunting" accent, which is formidable, yet it's just so much dressing on an opaque window. JE: I want to mention here that I think all the performances (except Nicholson's) are terrific, especially Mark Wahlberg and Alec Baldwin, who are very funny. It's just that, as these critics have noted, the actors aren't all given full characters to play. The roles played here by Damon, DiCaprio, Nicholson and (especially) Martin Sheen were much more fully developed (and morally conflicted) in "Infernal Affairs." Yes, what with bullets fired between eyes and bottles smashed to faces and severed hands encased in zip-locked bags, there's gore aplenty here — another Scorsese trademark from his vintage years. But, back then, the violence arose naturally (and thus frighteningly) out of the characterizations — out of a raging bull's jealousy, or a goodfella's temper, or a taxi driver's pent-up ennui. This violence, however, jumps haphazardly out of the twitchy plot (courtesy of William Monahan's erratic script), and so it often seems gratuitous, inorganic, just splatter for splatter's sake. Speaking of gratuitous, check out Nicholson, who, apparently channelling The Joker, mugs and rolls his eyes and delivers a performance as slovenly self-indulgent as his greasy comb-over. Astonishingly, Scorsese not only does nothing to rein him in, but occasionally adds an out-of-left-field sequence (the mobster in a literally operatic tryst with a couple of coke whores) that only encourages the guy's theatrics. The result? Rarely has a star's look-at-me turn so completely torpedoed a project. Whenever the picture threatens to gain some momentum, up pops Jack to stop it dead in its tracks. Neither a debacle nor a bore, "The Departed" works but only up to a point, and never emotionally—even if the director does contrive to supply his version of a happy ending. "I don't want to be a product of my environment," Nicholson boasts at the onset. "I want my environment to be a product of me." Yeah, yeah, and that's the problem. Overwrought as "The Departed" may be, it's nothing that wouldn't have been cured by losing Jack (and maybe half an hour). Too bad the bottom line meant Scorsese had to sell that hambone Mephistopheles his soul. Mr. Damon enters the story about the same time that Mr. Nicholson exits the shadows. Too bad he doesn’t stay there until the final credits. This Janus-like actor has long presented two faces for the camera, the jester called Jack and the actor named Nicholson. He has worn both faces for some of his famous roles, but over time he has grown fond of the outsize persona called Jack, with his shades and master-of-ceremonies sneer, and it’s hard not to think that the man has become his mask. Mr. Nicholson has some choice moments in “The Departed": he owns the thrilling opening minutes and is persuasively unnerving in his early scenes with Billy, whom he only knows as a neighborhood loser ripe for the plucking. 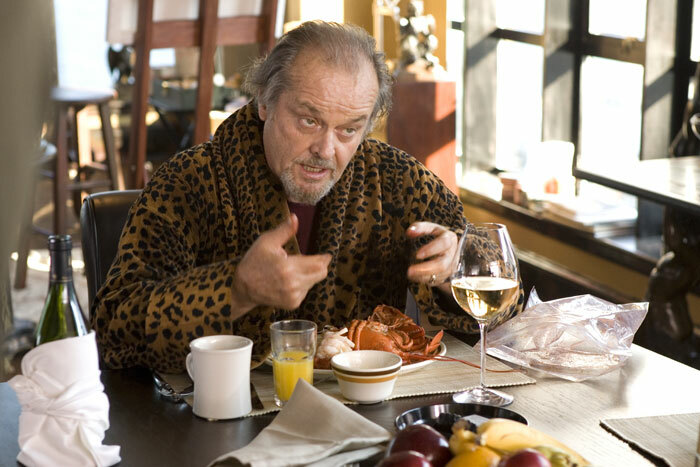 But as the story twists and twists some more, Mr. Nicholson begins to mix too much Jack into his characterization. In Alexander Payne’s “About Schmidt," he plays a man whose tamped-down disappointment meant that he had to pull the performance from deep inside; he committed to the part without the help of his sidekick persona. In “The Departed" he’s playing bigger and badder than life with engines roaring. It’s a loud, showy performance. Frank even comes equipped with a trove of gaudy accouterments: a goatee like an arrow, a leopard-print robe, a bevy of babes, a severed hand and a ridiculous fake phallus. Another actor might wear these accessories; Mr. Nicholson upstages them. Nicholson is often hilarious here, but I would have liked to see him mute the wackiness a little in the interest of the movie's overall tone. The cutesy last shot, which I'll leave as a surprise for the viewer, seems complicit with the jokiness of Nicholson's performance, and it does a disservice to the seriousness (not to mention gruesome violence) of much of what's gone before. Though "The Departed" has flourishes of black comedy throughout, it's not "Prizzi's Honor"; it's a truly dark movie in which many people die horribly, and ending on a goofy visual pun makes fools of the audience for caring. What do you think of 'The Departed'?